Graduation of WMATA’s third class of elevator-escalator apprentices. 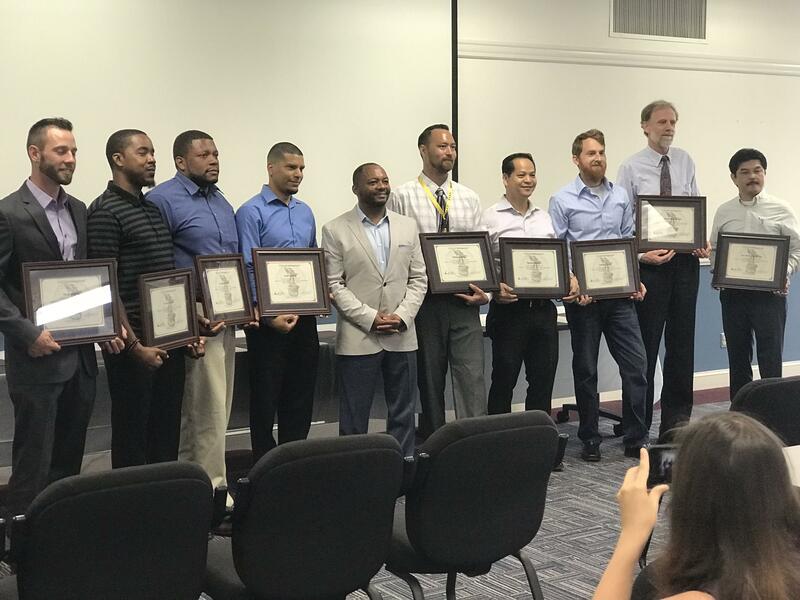 On August 17, 2018, Class 1401 graduated from WMATA’s elevator-escalator apprenticeship program. The WMATA elevator-escalator apprenticeship program was formed in 2001 in partnership with ATU Local 689 to maintain the over 900 elevators and escalators run by the organization. The apprenticeship program is a 4 year, 8,000 hour training program consisting of classroom instruction and On-the-Job (OJT) training. In addition, apprentices must pass a comprehensive written and practical exam required by the National Association of Elevator Safety Authorities (NAESA). WMATA has consistently participated in the Center’s Elevator-Escalator Consortium program to provide courseware for transit elevator-escalator technicians which places emphasis on adult learning styles and safety. The most recent class was made up of ten individuals, who each received a certificate marking their successful completion of the program using this standardized courseware. For more information on apprenticeship and/or assistance in implementing one at your location, contact Project Associate Karitsa Holdzkom .